Airway Orthodontics from our industry-leading orthodontist near Worcester, MA, is an interdisciplinary subfield of orthodontics that works to improve your overall health. 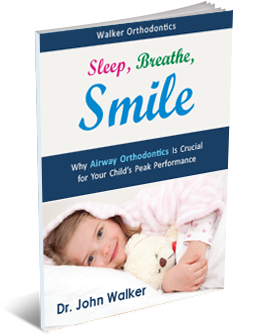 As the Director of Airway Courses at Boston University, Dr. Walker has the expertise necessary to help your child achieve an orthodontic outcome that does far more than produce a great-looking smile. He does this by addressing the effects that breathing and oral habits have on the jaw – and, conversely, the effect that facial shape has on breathing. Why Is the Way You Breathe Important? The way your child breathes can impact the way that oxygen gets delivered into the body’s systems. It is possible to breathe in a way that optimizes your overall health. However, it is also possible to breathe in a way that your body must compensate for lowered oxygen levels. If your body often struggles for proper oxygen levels, many long-term health problems can arise. Potential issues can include a raised risk for high blood pressure, heart disease, and diabetes. In younger children, the development of their facial shape can also be adversely affected by chronic mouth breathing. When Should Your Child See Our Airway Orthodontist near Worcester, MA? Has improper formation of the upper and lower jaws, or other components of the jaw and airway resulted in limited air flow during breathing? Are there other reasons for restricted airflow that are better addressed by another medical specialist? Has the patient had to compensate for limited airflow while breathing? Has this resulted in improper habits, such as accelerated breathing, tongue placement, abnormal swallowing, or body posture? Have these compensations influenced the shape, size, or position of the jaws, teeth, and face? If Dr. Walker identifies any issues that can be helped with orthodontic treatment, he will discuss his recommendations with you during your child’s free initial consultation. Airway orthodontic treatment is most effective in young children before their facial structure has fully developed. Our focus on early childhood facial and airway development uses minimally invasive techniques that are remarkably effective. In fact, after just a few weeks into treatment, we often hear that teachers notice improved behavior, classroom attention, and enhanced scholastic performance. During our free, no-obligation assessment, Dr. Walker will clearly explain his findings to you and will fully answer all your questions. If he believes treatment would be beneficial for your child, he will also discuss all aspects of that treatment and will ensure you are fully informed and comfortable before proceeding. To request your child’s free Walker Orthodontics Smile Assessment, call our orthodontic office at 978.345.7988 or click here for our online appointment request form. We look forward to joining you on the journey to your best health!